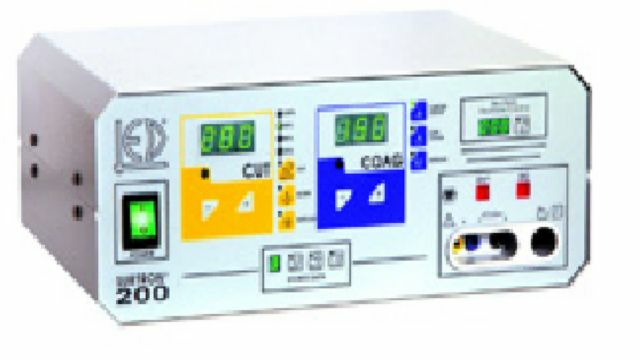 SURTRON® 200 is a proper diathermo-coagulator to monopolar or bipolar precise surgery. SURTRON® 200, allows to effect surgical minimally invasive treatment of resection, evaporation and coagulation. SURTRON® 200 through the selection of functions, it lets to effect pure (CUT), coagulated-CUT with different modulation duty-cycle (CUT90% - CUT80% - CUT70% - BLEND), surface coagulation (FORCED COAG), depth coagulation in absence of carbonization (SOFT COAG) and, with special adapter, bipolar cut (BIPOLAR CUT) and bipolar coagulation (BIPOLAR COAG). The digital reading of the delivered power and the overseeing through microcontroller of the operational functions, assure the absolute reliability of the conditions of job. SURTRON® 200 , by the ergonomic and safety solutions utilised, allows a highly professional surgery. It is continually monitored the connection of neutral electrode and, if a split neutral electrode is used, the impedance of the neutral electrode/patient contact is shown. The possibility to control by the handle the output functions, as well as the command of output power delivery, allows to implement the surgical operation without turning away the surgeon attention from the surgical field.